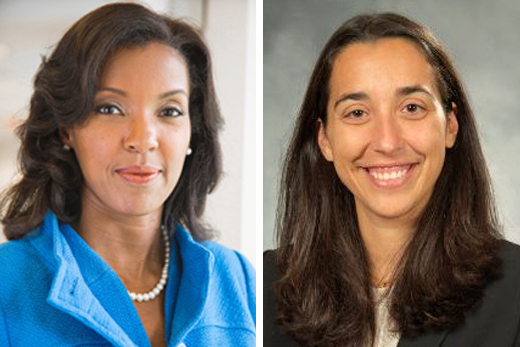 Goizueta Business School Dean Erika James (left) and MBA student Heidi Laki (right). As a product innovation manager for Reliant Energy in Houston, Heidi Laki 16MBA designed and developed products for the small-business sector. Now a Woodruff Scholar working toward an MBA at Emory’s Goizueta Business School, she is preparing for a career in strategy consulting. Laki is an example of the caliber of student that scholarship support attracts, and she is among a growing number of women who are gaining the competitive edge that comes with a Goizueta Business School education. More than a third (35.7 percent) of the current student body is now female, and Goizueta’s new dean, Erika James, is breaking ground as the first African American woman to head a top-25 U.S. business school. Among James’s priorities for the business school is to increase philanthropic support for scholarships, which will improve Goizueta’s ability to compete for the best students. Scholarship support also creates a diverse student body, which in turn helps prepare students to succeed in a diverse global workforce.